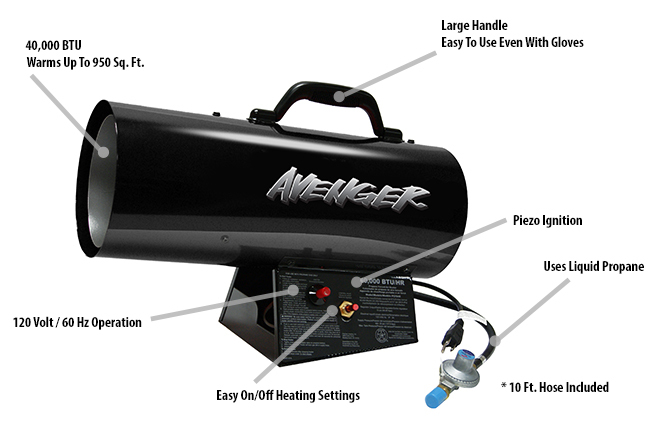 The Avenger Liquid Propane (LP) Forced Air Heater gives you reliable temporary heat for any construction sites, warehouses, garages, industrial work space, and more. Easy to use and no assembly required, these heaters provide instant portable heat. This heavy-duty heater turns up the heat! (LP tank sold separately). Includes many features like the Thermally Protected Motor for long life and endurance. Produces 40,000 of BTU output to warm up to 950 square feet. Designed, Engineered and Assembled in the U.S.A. Product Weight (Without Propane Tank): 12.5 lbs.